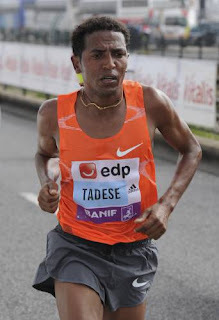 Zersenay Tadese during the unbroken world record half marathon at Lisbon in 2010. Readers will recall that in a recent post, I did an exercise to calculate Riegel fatigue factors from updated world record performance times for women's road and track racing. I then ran some numbers on a near-world class local female runner aged almost 40 to predict her half marathon time from her most recent 10K time. The Riegel model predicted the closest times to her actual finishing time compared to several other models widely available on the internet. In this post, I attempt the same thing for men's road and track racing. I constructed a table with the latest road racing world record times for men. The following ln-ln plot of time to distance results in a slope of -0.0497 (R2 = 0.8101). When corrected into the fatigue factor form, it results in a number 1.0497. This is a bit different to Riegel's estimation of 1.07732 back in the day, a percentage decrease of 2.5%. Fig 2 : Table showing the data behind the updated Riegel model for world class men's road racing. Apart from Stanley Biwott's 1:27:13 30K, no major recent records have been set in other distances. This shows the strength of Kimetto and Tedese's placings in the long and mid-distance categories. These records haven't been broken for several years although EliUd Kipchoge seems very hungry in 2017. A world record attempt at the marathon may mean taking out the half marathon world record in the process. The following ln-ln plot of time to distance for men's track results in a slope of -0.0777 (R2= 0.9901). When corrected into the fatigue factor form, it results in a number 1.0777. There are two interesting aspects to this number. First, the linear fit is very close to actual results. Secondly, this number is very close to Riegel's estimation of 1.07732 back in the late 1970's. Fig 4 : Table showing the data behind the updated Riegel model for world class men's track racing. No recent upheavals have happened in men's track racing, with the last record in the 25k and 30K distance being established in 2011. El Guerrouj, Bekele and Gebrselassie's records meanwhile have stood the test of time proving the remarkable forms they were in when they competed. I applied the Riegel fatigue factor for young male world class road racing to a 30 year old long distance runner Y to see how off the predictions are when using his 10K time to predict half marathon time. Both the races were held in the U.A.E and just a couple of months apart. Runner Y is a local running celebrity of sorts, having established record times in everything from your weekend park run predictor to the RAK half marathon. The math behind the following predictions were already explained in the past post. Outcome : The prediction was under-estimated by 3 minutes 11 seconds. Runner Y finished in 1st place at the half marathon. The 2nd placed male runner finished in 1:15:06. For that difference in outcome between first and second place, the Riegel method still predicts the podium. So in a corrupted yet logical way, it appears that the difference of 00:03:11 is something we can live with. The following table compares Y's actual performance with old and new Riegel models and several other running predictors easily available on the internet. Please keep in mind that the case study was to predict half marathon time using 10K time. Fig 5 : Comparison of updated Riegel prediction for men's road racing against 10 other models widely available on the internet. The error in prediction in also calculated and shown. As shown in the table, the updated Riegel method performs the best prediction among several other models. In the women's case as well, it performed the best half marathon prediction. Please note that the Runner's World predictor tool did not work. The times entered were outside the "limits" of the tool, which perhaps is something deliberately programmed by them to prevent application for elite athletes. In this writeup, I updated the fatigue factor or what people term the Riegel exponent to include road racing and track racing data for men. The updated fatigue factor for world class road racing = 1.0497 and that for world class track racing = 1.0777. As opposed to women's racing, what is remarkable is that several of the men's records in both track and road have stood the test of time. Very few records have been broken in recent years. This further re-inforces the fact that there is more news to cover in women's racing, it's alive and kicking and these are exciting times. Men have some catching up to do. I used the updated Riegel model for men's road racing to predict the half marathon performance of a 30-35 age bracket world class road runner living in the U.A.E. The Riegel model appears to give the best prediction when compared to 10 other models. Further, the updated Riegel fatigue factor gives a better prediction in the case study that the number from Riegel's original paper. When considering both the men's and women's prediction I wrote about, the Riegel method appears to be a simple and reliable method that anyone could easily program. The fatigue factor can also be tweaked to fit the data of specific runners. Coaches are advised to guide with application and interpretation issues for recreational runners especially those above the age categories that the model was made from. As shown in this post, prediction tools are only a guideline. Runner's World Predictor : Link. Daniel's Equivalence Predictor : Link. McMillian Race Predictor : Link. Godwin Race Predictor : Link. Purdy, Cameron & VO2 Max Predictors : Link.